The price starts from AED 144,900 including VAT. 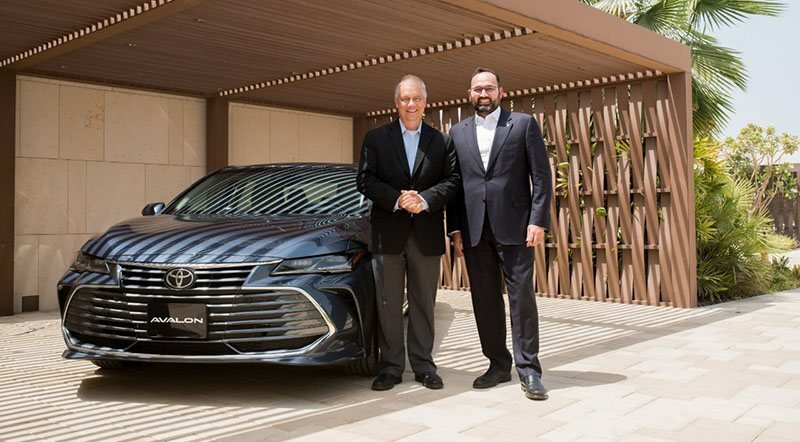 Focusing on two keywords in their development model: Authenticity and Exhilaration, the Japanese automaker has introduced 2019 Toyota Avalon in the UAE, which serves as “Brand Catalyst” and defines Toyota’s direction for the future. Al-Futtaim Motors, the official distributor of Toyota vehicles in the UAE, carried out the unveiling. The Avalon has always been known for its class-leading roomy interior, style and fuel economy and the all-new 5th-generation is no different. Supported by the Toyota New Global Architecture (TNGA) platform, it has all the features, which make the ride comfortable, stable along with improved fuel economy and a horde of advanced safety and comfort facilities. The TNGA platform, which signifies an entirely fresh approach to the way the automaker designs, engineers, and packages its automobiles, has allowed the 2019 Avalon to be longer, lower, and wider than its predecessors. On the outside, we see a sport front grille, the slim all-LED headlamps, side air intakes in the front bumper and the rear combination lamps with a distinctive 3-dimensional slim aero fin shape combine backup, stop, and turn lights into a single balanced, fluid form. The 2019 Toyota Avalon is accessible in eight distinct exterior colors permitting buyers to express their personality. The interior, which is available in four-color options – Brown, Beige, Gray and Black and with the option of wood or hydrographic ornamentation depending on the grade, gives a feeling of style, luxury, convenience, and comfort. The advanced interior facilities comprise an improved 9-inch multimedia display, a 10-inch colored and adjustable head-up display (HUD), wireless charging system for smartphones, ambient illumination, dual-zone automatic air conditioning system, 14-speaker JBL surround sound system, multi-adjustable power and ventilated front seats, in addition to 60:40 split folding rear seats. The TNGA platform does not only focus on the visual appeal, it also makes the driving more fun and exhilarating. The new multi-link rear suspension has given the luxury sedan a wider rear track, a lower center of gravity, and an aggressive stance. The ride can be Normal or Sporty with the first prioritizing comfort while the latter makes handling tighter and highly responsive. When it comes to power, the 2019 Toyota Avalon is not a slouch in any way. The 3.5-liter V6 engine pumps out 298 hp and 356 Nm of torque and boasts Direct Injection 4-Stroke Gasoline Engine Superior Version (D-4S) and Variable Valve Timing-intelligent Wide (VVT-iW) systems to attain supreme power, environmental performance, and fuel efficacy. The engine is paired with an all-new eight-speed automatic transmission. Toyota prioritizes passenger safety and the Toyota Safety Sense is a good example of the automaker’s fruitful efforts in this department. Toyota complements safety facilities like 10 SRS airbags, Vehicle Stability Control (VSC), Traction Control (TRC), Anti-lock Braking System (ABS), Electronic Brakeforce Distribution (EBD), Brake Assist (BA), Electric Parking Brake (EPB) with Brake Hold function, Blind Spot Monitor (BSM), Rear Cross-Traffic Alert (RCTA), and Hill-start Assist Control (HAC), with Pre-Collision System (PCS), Dynamic Radar Cruise Control (DRCC), Lane Departure Alert (LDA), and Automatic High Beam (AHB). Interested buyers can head to any of the Al-Futtaim Toyota showrooms and get the key of all-new 2019 Toyota Avalon by paying AED 144,900 including VAT for the SE+ model and AED 164,900 for the Limited grade. The current 2018 Avalon starts at AED 119,900.